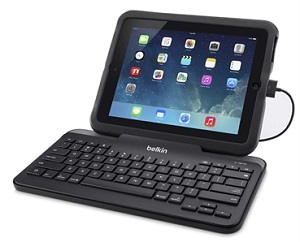 The Belkin Wired Tablet Keyboard with Stand connects directly and securely to an iPad, and it does not require batteries or recharging. An integrated stand is designed to fit even the largest cases and is shaped for stacking multiple keyboards. Cable management ensures that your cables are safely and neatly tucked away, making it the perfect solution for classroom testing. The durable design features pryresistant/full-size keys made specifically for students. Its plug-and-play simplicity enables reliable, easy functionality for PARCC and SBAC testing or general classroom use. Tablet shown in image not included.